I completed this stitch sampler today. 7. Still in the process of combining this stitch with other stitches, the first row is a combination of buttonhole stitch and knotted buttonhole stitch, and bullion knots and French knots are worked over the knotted buttonhole stitches. 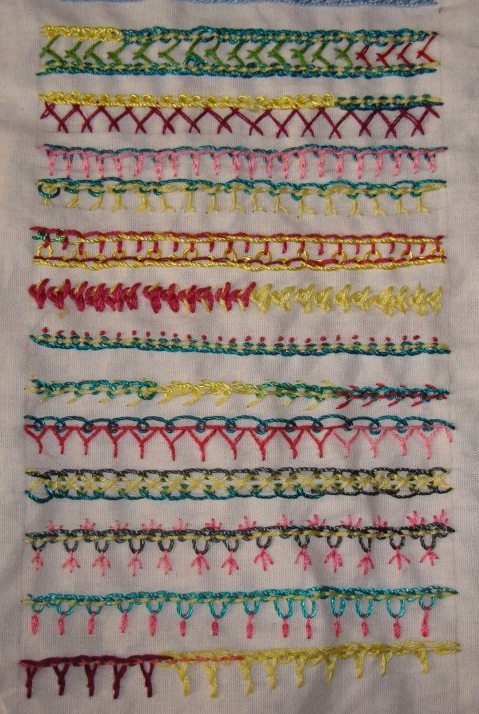 The second row is the combination of this stitch with detached chain stitch. 8. 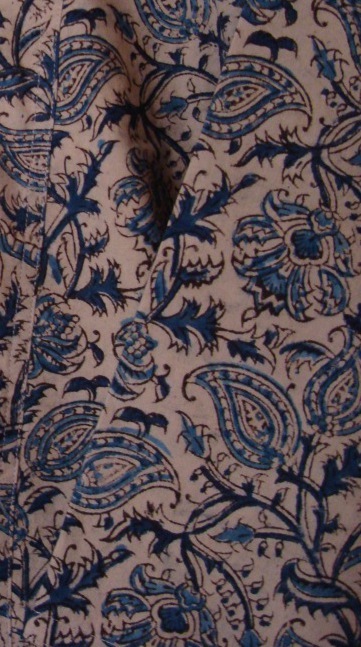 The first row is unsuccessful combination of feather stitch variation and knotted buttonhole. In the second row, this stitch is combined with chevron stitch. The third one, two rows of knotted buttonhole stitches worked together. 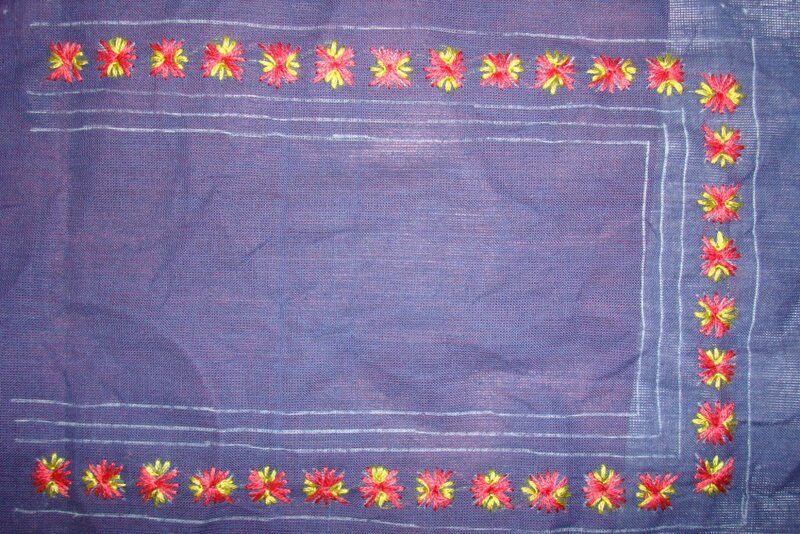 9.The first row is worked with bugle beads, in the second row, the knotted buttonhole stitch is whipped in dark pink thread. This was easy stitch to work. Initially I thought it resembled up and down buttonhole stitch, after starting this stitch, realised this was not so. This knot also helps to keep the stitch in its place, sometimes the buttonhole stitches tend to slide from their position, when the stitch angles vary. I thoroughly enjoyed working on this sampler. I need to catch up on previous week stitches. 4. In the first row, three buttonhole stitches with varying heights are worked with the knot, and two variations of this stitch combined together in the second row, and an angled version of this stitch is worked in the third row. 5. knotted button hole is worked with other stitches in these rows. The first row- pistil stitch, detached chain stitch and fly stitch are worked over a row of knotted buttonhole. The second row, the stitch is combined with closed buttonhole stitch. The third row, herringbone is combined with this stitch. 6.combination with other stitches are continued in these rows too. Knotted buttonhole with bonnet stitch in the first row, chain stitch with this stitch in the second row, Cretan stitch with this stitch in the third row. 1. First row is the basic knotted buttonhole stitch, the second row is the shorter version of the stitch and the third row is the long and short version of the stitch. Fourth row is done with two threads. 2. The bigger knotted buttonhole stitches are worked over the smaller knotted buttonhole stitches in the first row, the second row is also similar except, the bigger atitches are worked between the small stitches. The third row is the zigzag version of the stitch. 3. In the first row, this stitch is worked in a curve, in the second row , the second buttonhole stitch is longer than the first one on the top[ does not look appealing, though] the third row, the short and long buttonhole stitches are knotted together at the base. Still working on variations of this stitch, details on my next post. 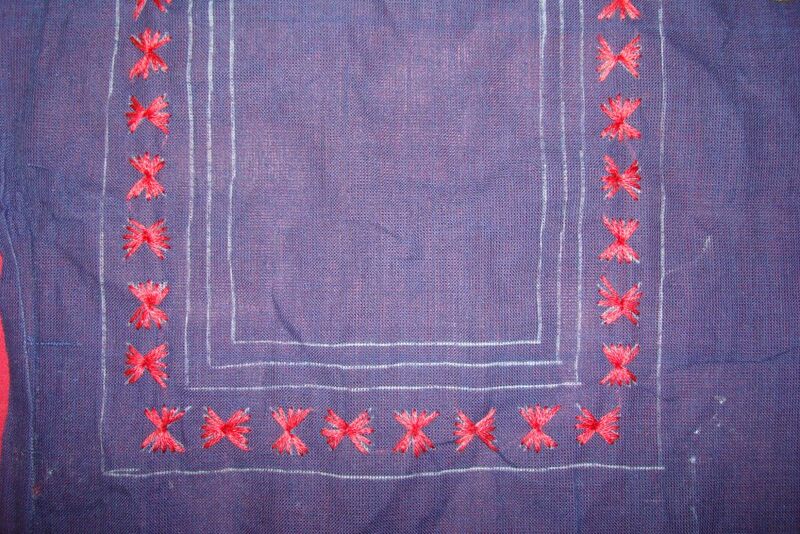 The details of the embroidery on the yoke in red fabric. 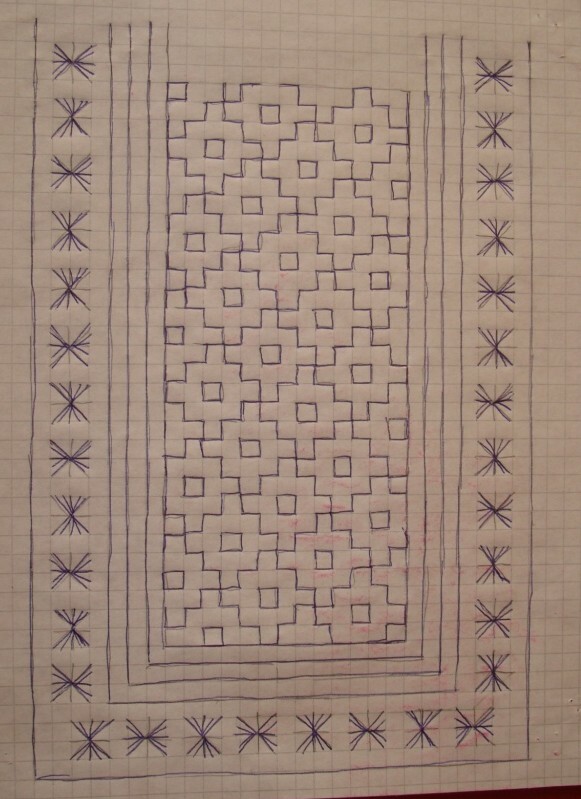 this is filling pattern as seen on the pattern drawing posted before. 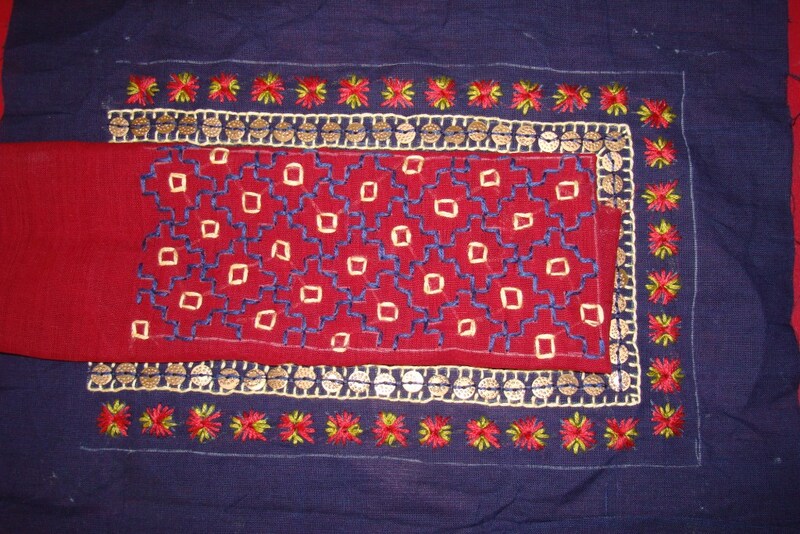 The embroidery was done in double running stitch with red and beige threads. 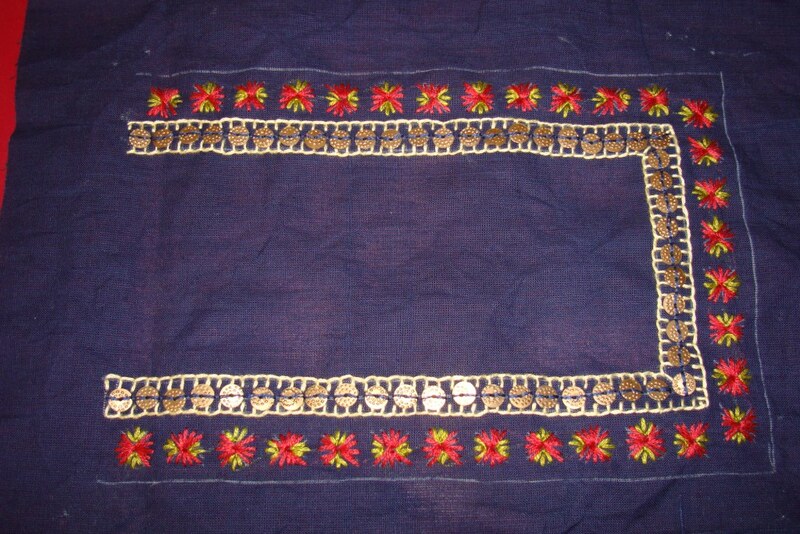 I have worn this tunic with blue salwar [Indian pants], and I like the border design better than the filling design . The antique sequins matched well with the yoke and the tunic. 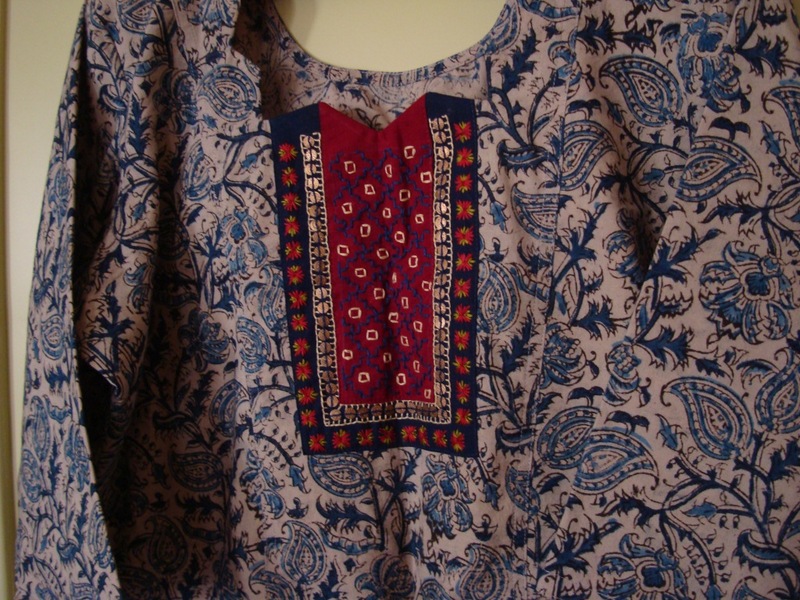 More details on this two part yoke of the kalamkari tunic. After working a variation of Rhodes stitch around the border in red thread, fly stitches are worked on the sides of the Rhodes stitches. 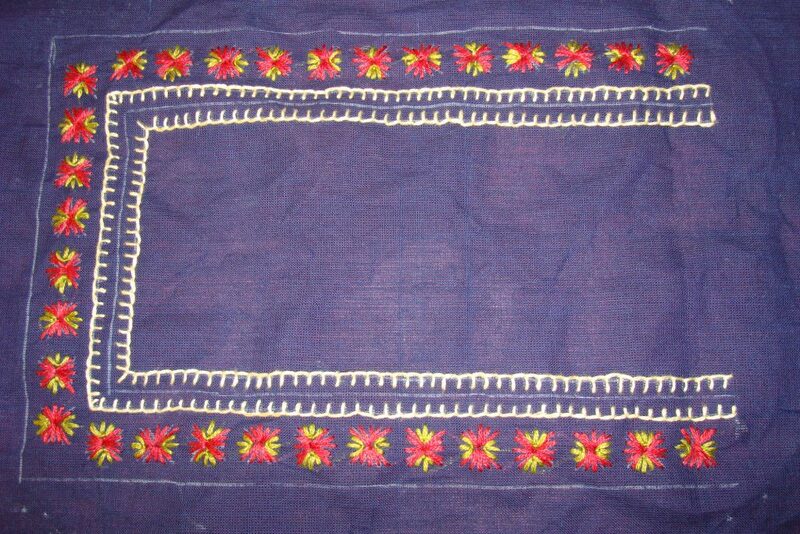 Two rows of buttonhole stitches are worked on the inner borders with tunic fabric colour thread. Round antique gold sequins were attached between the buttonhole stitches. 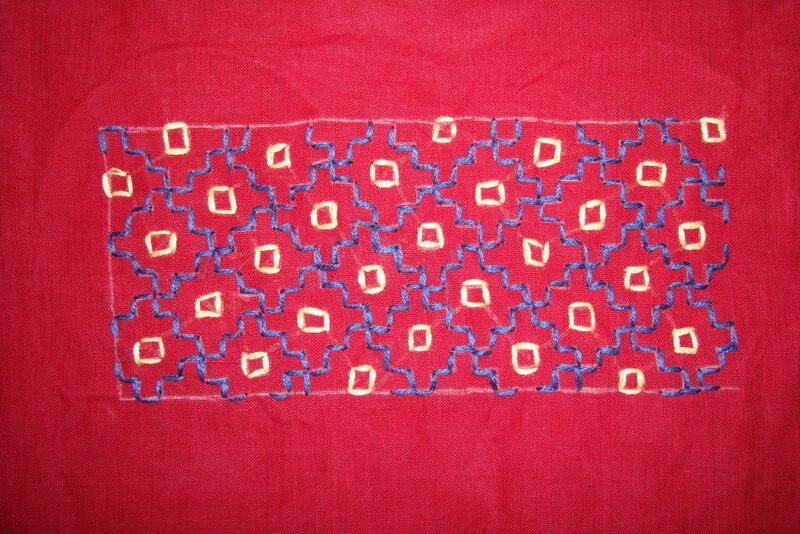 Details of the embroidery on red fabric and the completed tunic will be on the next post. 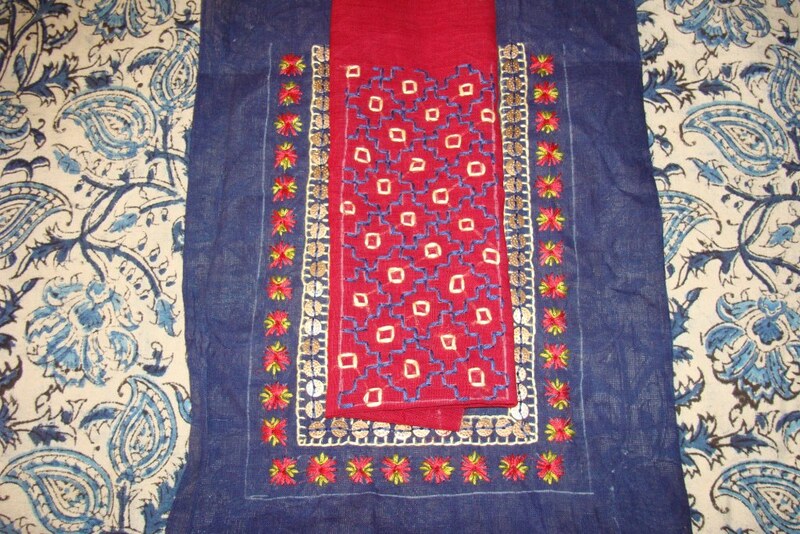 The central filling pattern was embroidered in red fabric and the border was worked in red fabric. Today I worked a few more variations on this Pekinese stitch sampler . 8. In the first row, French knots are worked over a line of Pekinese stitch, and in the second row, Pekinese stitch is worked on feather stitch. 9. Pekinese stitch is worked on half chevron stitch in the first row, and both sides of the cross stitch line is worked in pekinese stitch, I liked this treatment. 10. In the first two rows, I used fly stitches and detached chain stitches to elongate alternate curves of Pekinese stitch. Last row is a combination of pekinese stitch and Cretan stitch. With this seam, the Pekinese stitch sampler is completed. Though this stitch was simple, it was time consuming to work the basic back stitch for all rows. It was hard to maintain the tension in the beginning , later it became manageable. Enjoyed working on this stitch sampler.